The deeper significance of the project Asher chose became clear after the activity took place — a cleanup at Olivewood, one of Houston’s oldest African-American cemeteries. Asher’s Eagle Project encapsulates the Spirit of Houston — a welcoming city that takes pride in its diversity. Burials took place at Olivewood for nearly 100 years, beginning in 1875. In recent years, the Descendants of Olivewood have struggled valiantly to restore the overgrown oasis, where tombstones had toppled and some graves are in danger of falling into the White Oak Bayou. 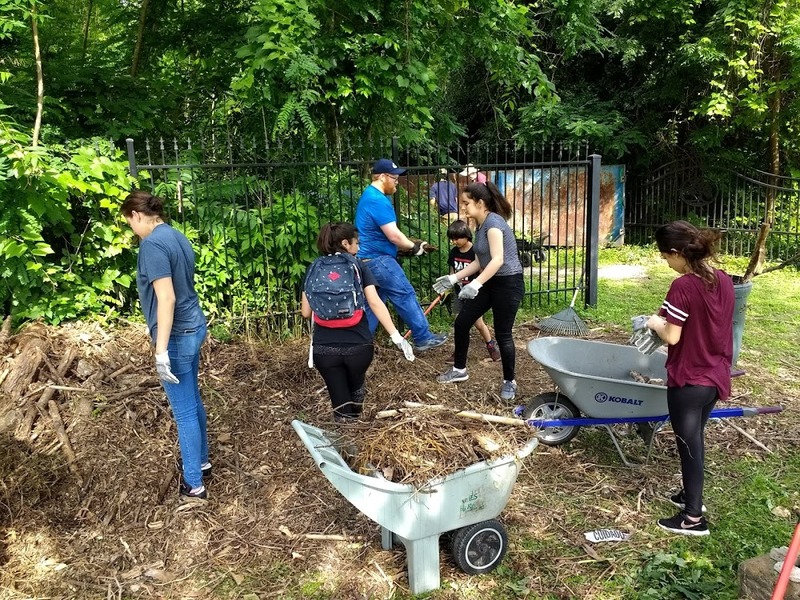 Led by Asher, on a beautiful Saturday morning, about 80 volunteers transformed the once-neglected resting place of many members of the city’s post-emancipation community. They mowed grass, chopped away heavy overgrowth, hauled debris and planted flowers. The enthusiastic workers demonstrated the same Spirit of Houston that was dramatically shown in 2017 when floodwaters devastated the city. During and in the aftermath of Hurricane Harvey, the world witnessed the heart-wrenching story of neighbors helping neighbors without concern for the common points of division — race, religion, ethnicity, economic status. 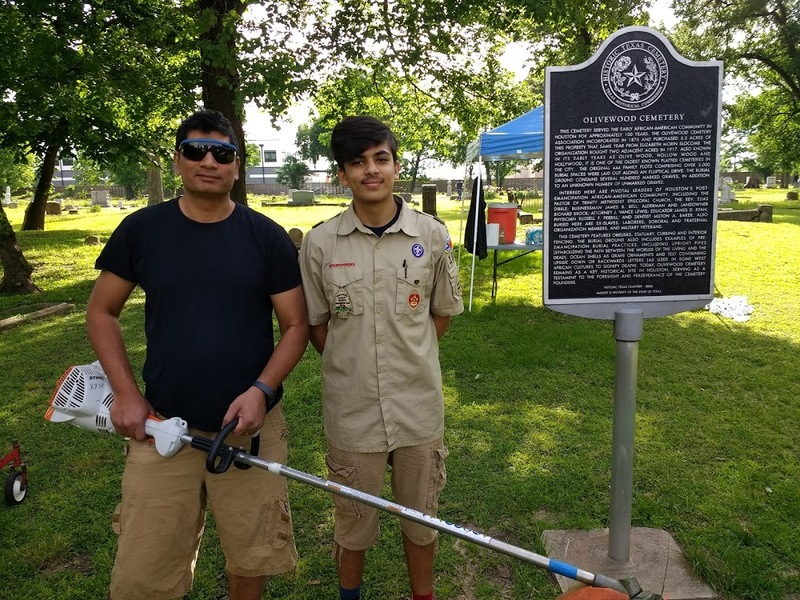 On a far smaller scale, the same story is revealed in the Eagle Project of Asher, a 16-year-old Pakistani refugee who is a member of Troop 1881, Sam Houston Area Council, Boy Scouts of America. Asher came to the United States less than three years ago with his father, Johnson Joseph; mother, Fouzia Kanwal; and two younger brothers, Dawood Faris and Ryan. The family had managed to leave Pakistan for Malaysia when Asher was nine years old. They had survived under difficult circumstances for 3 ½ years, as refugees in Malaysia, waiting for a chance to begin a new life. Asher’s parents had always struggled to provide every opportunity they could for their children. He says he made a concerted effort to ensure that English would be his children’s “first language.” Even when the children attended inferior schools for refugees, he and his wife worked to prepare them to do well academically when, hopefully, they’d be able to study in better schools. 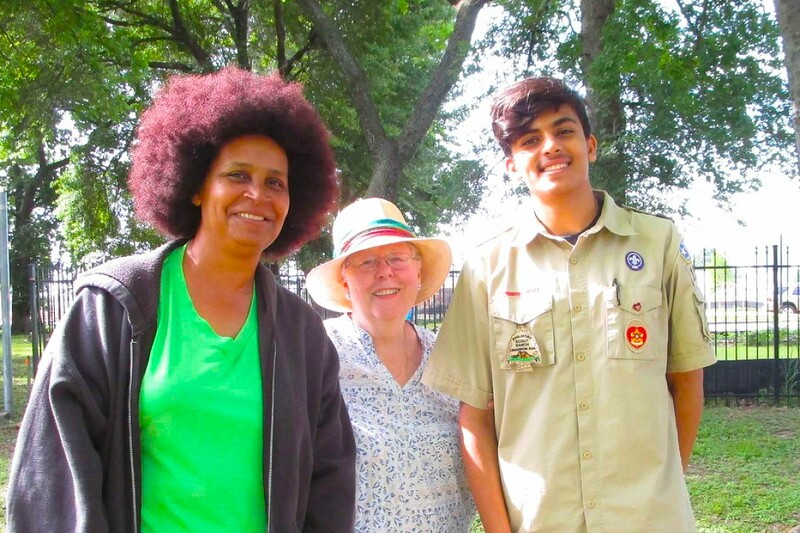 A few days after the family’s arrival in Houston, Asher and Dawood Faris, who is a year younger, were invited to join Boy Scout Troop 1881, sponsored by the Hermann Park Ward of the Church of Jesus Christ of Latter-day Saints. Less than three years later, Asher had advanced in the Scouting program to the point that he was ready for his Eagle Project. His success at school also was remarkable. Asher is now a sophomore at one of Houston’s leading public high schools — DeBakey high School for Health Professionals. Support for Asher’s Eagle Project was provided by the Houston Texas Stake of the LDS Church. It gave members in nine congregations – including three in which services are conducted in Spanish — an opportunity to participate in conjunction with Houston Compassion Week 2018, a citywide program promoting community service. Asher involved fellow Scouts and students. With assistance from his Scout adviser, Robert Shong, he arranged with Keep Houston Beautiful to borrow lawn mowers, weed eaters, loppers and other supplies ranging from work gloves and goggles to rakes, trowels and shovels. He surveyed cleanup needs under the direction of Descendants of Olivewood president and volunteer coordinator Margott Williams. Committee members stepped up to pay the $100 deposit for a dumpster, which was delivered and picked up by Keep Houston Beautiful. They also contributed funds to rent sanitary facilities for the cleanup day, since no restrooms or water are available at the cemetery. Other volunteers contributed flowers and supplies for planting them. “There was work to be done at Olivewood by people of all ages and abilities. Our main concerns were getting enough volunteers and having enough equipment,” Asher says. The need to load, transport and store equipment from Keep Houston Beautiful presented challenges. 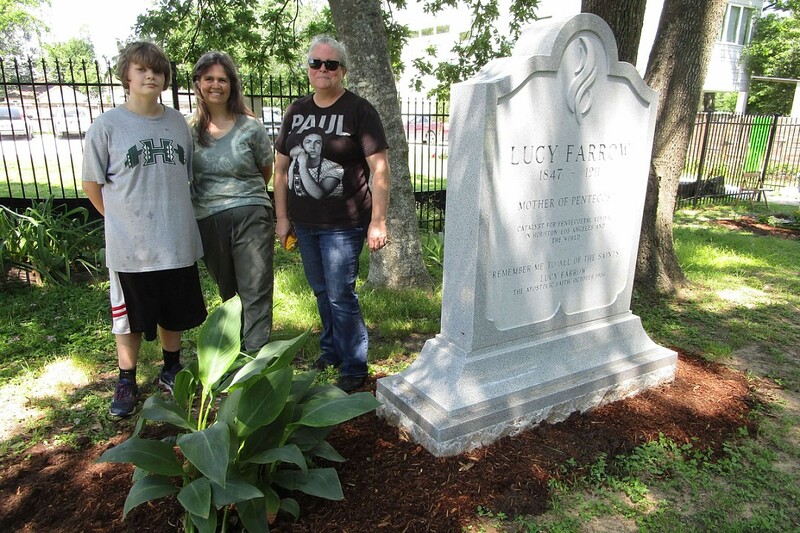 In the final days before the Olivewood work day, two companies that are located near the cemetery provided help on both fronts — volunteers and equipment. Principals of the companies are relatives of a committee member. Their participation added to Asher’s project’s diversity mosaic. The company owners are Palestinian-American Moslems and many engineers, architects and other employees working with them have come to Houston from other countries. Interland Surveying & Mapping provided its brand new truck and an employee to drive it, assist Asher’s father load equipment and work at during the event. Among the volunteers who responded to the committee’s invitation to join the work party was The Interfield Group’s office manager, Pat Mata, who is Mexican-American. She came with a backpack loaded with tools and water and worked hard the entire morning in an area near the bayou with heavy overgrowth, leaving with a blister on her hand, scratches on her leg and the memory of when she stepped on one of the large spiders. An Interfield engineer, working in the office on Saturday, accepted an invitation to stop by Olivewood. Originally from Lebanon and a poet, Mohamad Noureddine was inspired to compose a philosophical poem (in Arabic) about the people who lie buried in this cemetery. To the relief of Asher’s main team of supporters, at the scheduled time, families, teenagers, young children, men and women, boys and girls – Spanish-speaking, English-speaking – arrived ready to work, with smiles on their faces. Asher and his team were relieved to find they had enough equipment on site to do the job. Many people brought their own tools. Olivewood provided three lawn mowers and several people brought others. By noon, when the work ended, the entire cemetery had a manicured look. Little children picked up sticks. Young boys eagerly filled carts with rubbish and took them to the dumpster. High school students joined them with loaded wheel barrows. It seemed everyone wanted to help. A neighbor, out walking his dog, said, “If you need water, you can use the spigot on my house.” Thanks to the offer, a 10-gallon cooler of water for plants was loaded onto a wagon and refilled a couple of times. Volunteer Shelly Gonzales and her six-year-old twin sons Enzo and Salvador brought a watermelon, which they shared with others eager for a little refreshment. A woman whose own home has such a gorgeous garden that it was chosen to be included in Houston’s prestigious River Oaks Azalea Trail heard a call for volunteers from the podium at church, put on her boots and hat and came with a rake, ready to work. “A lot of the women at church have little children and it’s hard for them to get away. It was easier for me,” she said. Members of the Spanish-language congregations who depend on yard work to support their families came, too. With assistance from a 12-year-old Scout, a group of women dubbing themselves the “Flower Ladies” changed a dry plant bed under the Olivewood sign into a garden of native Texas plants requiring little water. One of the women — who is leaving with her husband to work in Ukraine as a senior Peace Corps volunteers — dug up the lilies in her yard and added them to the flower bed. Without trying, the Olivewood Cemetery Compassion Week and Eagle Scout project became an activity creating a mosaic of service by a diverse group of people who just wanted to roll up their sleeves and help. THORA QADDUMI is a Houston-based freelance writer and supporter of the Boy Scouts of America. See our photo gallery for this event by clicking here.